I’ve been MOOCed. And it’s not as if I could have avoided it. I knew, as soon as I began exploring the topic of massive online open courses (MOOCs) in November 2012 with colleagues on the New Media Consortium (NMC) Advisory Board for the 2013 Higher Education Edition of the Horizon Report, that it would only be a matter of time before I stepped into the vortex and was completely immersed in learning more about the topic. It’s not as if I fought it very hard; when Google recently announced its Advanced Power Searching MOOC, I registered for that course. But the increasingly frequent references I’ve been seeing to ETMOOC—the Education Technology and Media course organized by University of Regina professor of educational technology and media Alec Couros and several “co-conspirators”—made me curious enough to dip a virtual toe into the MOOC surf. And, as so often happens when we stand too close to the water, I’ve been swamped by an enormous wave of MOOC. This is a community under development, a place where trainer-teacher-learners are working with each other to explore a variety of topics in two-week chunks: connected learning, digital storytelling, digital literacy, the open movement, and digital citizenship. The use of technology is not only at the heart of our learning explorations, but provides the tools for those explorations: live online sessions held in Blackboard and archived for those who can’t attend the live sessions; a network of blogs; a twitter hashtag (#etmooc); a Google+ community with connections via Google+ Hangouts; postings on YouTube; and content on social bookmarking sites including Delicious, Diigo, and Reddit. And while Couros is clearly at the center of the process, his conspirators and the learners are, with his encouragement, very much building the course by developing content as we go, as Sue Waters did in a blog post that about working harder and staying connected in a learning community—her guide to how to use the various course tools to engage in effective learning opportunities. There is also a “Dynamic Guide to Active Participation” that could serve as a primer for anyone interested in developing great contemporary learning habits, and a “Dynamic Guide for Facilitators” that will be a tremendously valuable resource for any trainer-teacher-learning working in online environments. And by encouraging us to learn by participating, by creating content and establishing new online accounts in platforms including about.me, and by engaging in conversations that extend far beyond any formal onsite or online classroom walls, they are inspiring all of us to contribute our own learning objects—like this blog post—that extends the conversation and the learning even further. N.B. 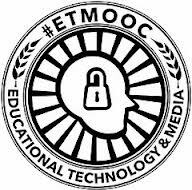 : This is the first in a series of posts responding to the assignments and explorations fostered through #etmooc. This entry was posted on Saturday, February 2nd, 2013 at 1:11 am and is filed under e-learning, etmooc, technology. You can follow any responses to this entry through the RSS 2.0 feed. You can leave a response, or trackback from your own site.